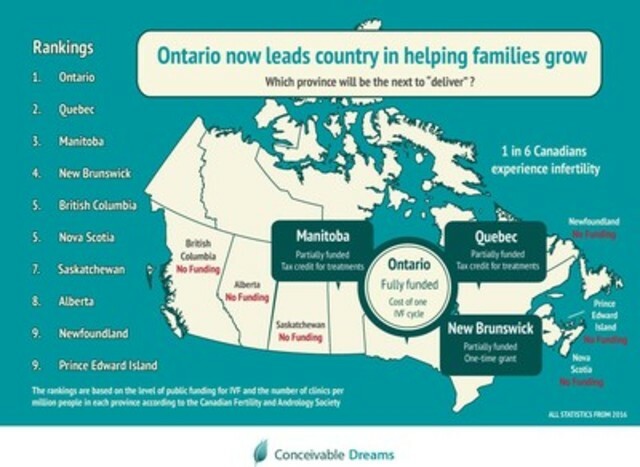 TORONTO, May 11, 2016 /CNW/ – Ontario leads among the provinces in Canada when it comes to providing access and support to families and individuals struggling with infertility, a new ranking of provincial jurisdictions found. The 2016 rankings, released by infertility patient group Conceivable Dreams in advance of Canadian Infertility Awareness Week, credited both Ontario’s decision to begin funding one cycle of in vitro fertilization (IVF) and the choice of fertility clinics in the province with its top spot in the rankings. Currently, four provinces provide some form of financial support to assist families seeking IVF: Ontario, Quebec, Manitoba, and New Brunswick. Quebec, which was once seen as a leader in Canada in its support of infertile patients, has dropped behind Ontario since it stopped fully funding IVF in late 2015. The ranking, however, recognizes the province still offers some financial support through its newly-implemented sliding scale tax credit for expenses related to IVF based on income level, and continued coverage of fertility drugs. Manitoba and New Brunswick, which offer a tax credit and one-time grant to patients respectively, placed third and fourth. In recent years, some provinces without funding for fertility treatments (Alberta and British Columbia) have begun calling for the implementation of their own public funding models to assist families looking to expand their families through IVF. Prior to the Ontario government’s decision to contribute to the cost of one IVF treatment cycle, most patients faced financial barriers when it came to receiving the treatment which can cost as much as $10,000 per cycle. The province also boasts the highest number of IVF fertility clinics per million people, as listed on the Canadian Fertility and Andrology Society’s website. Conceivable Dreams believes that having a healthy number of clinics per million is an important factor for patients seeking IVF treatment, as it ensures they have some choice in where they access what can be a very personal and invasive procedure. The number of clinics can also equate to better coverage outside major urban centres. The organization believes it is no coincidence that the province with the best funding also boasts the greatest number of clinics for patients to access and choose from. During Canadian Infertility Awareness Week, Conceivable Dreams wants to create awareness around the growing issue of infertility which now affects one in six Canadians. It hopes that informative tools such as this ranking will help to spread the word about available opportunities and highlight the need for more publicly funded programs across the country. The infographic above provides a visual representation of the current status of public funding for IVF in Canada. These rankings are based on the level of provincial funding dedicated to treatment, as well as the number of available fertility clinics per one million people.